I bought this “High Quality Smooth Paper” spiral notebook from Muji years ago, as a less expensive alternative to my favorite spiral notebook, Rollbahn. The body paper in this notebook also looked very similar to the non-spiral, perfectbound “High Quality Smooth Paper” notebook from Muji, which I like very much, so I decided to give it a go. After using it for the past 4 months, I have to say I don’t think it will replace my spiral Rollbahn notebooks. By all accounts, it’s a great notebook, with very sturdy covers, elastic closure, good body paper, and even a small interior pocket on the front-inside cover. The double-spiral is a perfect size, too, making page-turning smooth and easy, and its minimal design makes it a very versatile tool. Width comparison (from top): the perfectbound “High Quality Smooth Paper” notebook in B6, the spiral version in B6, and Delfonics Rollbahn spiral notebook in size “L”. But I can’t shake the feeling that the pages are slightly too narrow. Perhaps I’ve gotten too used to the Rollbahns? The body paper in the Rollbahn (in the “L” size) is indeed slightly wider, by 4mm. Am I sensitive to that small of a difference? Maybe so. But then again, even compared to the perfectbound version with the same width, the body paper in this Muji notebook feels narrower because of the spiral cutting into the usable space. In terms of paper quality, the body paper looks and feels the same as the one in the perfectbound version. They are both off-white, with 6mm (0.24") ruling in light gray. And it’s smooth enough for most of my pens but not ideal for fountain pens, with some feathering and bleed-through (see pictures below and my previous post on the perfectbound version). That alone wouldn’t be a deal breaker for me, but if I were to choose between the two versions that have the same body paper, I’d go with the one without the spiral. Plus, the non-spiral version gives me a tiny bit more real estate, at a lower price tag ($3.50 USD vs. $6 for the spiral one). Body paper comparison (clockwise from top): the perfectbound “High Quality Smooth Paper” notebook from Muji, Rollbahn, Field Notes Ambition, the spiral “High Quality Smooth Paper” notebook from Muji, original kraft Field Notes. This is a great notebook well worth its price, with enough attention to details where they count. I really hate to say anything negative about it because it’s probably the best ruled, spiral notebook I’ve come across at this price point, but it’s just not for me at this time. After I finish this one, I think I will go back to either the softbound High Quality Smooth Paper notebook or my dwindling supply of fountain pen-friendly and wider Rollbahn notebooks. 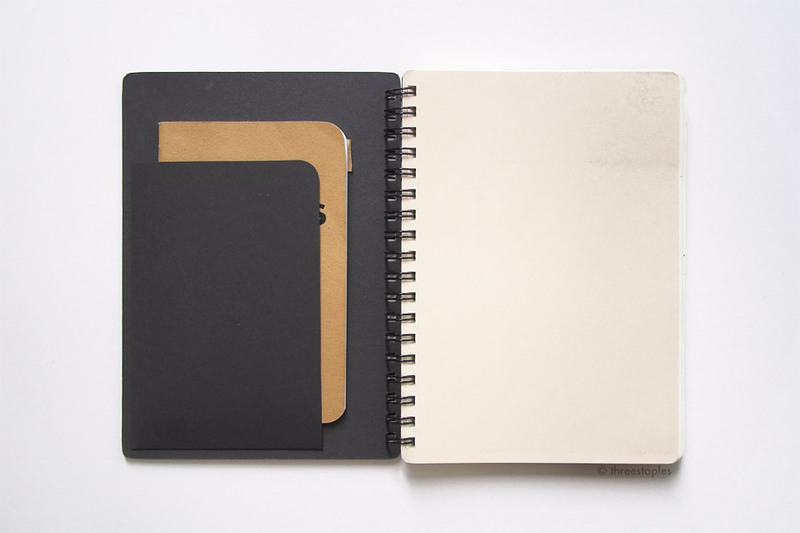 One feature this notebook has that I wish was in the perfectbound version: the subtle, linen-like texture on the covers that make the notebook look and feel more expensive than it is. Have you used this Muji notebook before? What are your thoughts on it? Hey, look! A notebook that’s not Field Notes! This notebook has NO STAPLES. This Muji “High Quality Smooth Paper” notebook in B6 is something I picked up last year while searching for a decent non-spiral notebook. I don’t hate spiral notebooks but I think I’m still recovering from Mead notebooks from my younger years. The spiral on those would always get deformed one way or the other, making page-turning a nuisance.. Not to mention, they were ugly. Out of schools, I’ve used plenty more spiral notebooks and sketchbooks that are slightly higher quality, and never actively looked for non-spiral ones. Probably because I didn’t know any better and was unaware that other options existed. Moleskine, I tried at some point, but I never got into them. And then a couple years ago, I started getting back into stationery more seriously, and started daydreaming about non-spiral notebooks that lay flat when opened. Spiral notebooks by nature don’t have that problem but I learned over the years that many hardbound or perfectbound journals and notebooks don’t stay open and are too fussy for me to handle. Then Muji opened here in San Francisco, and this notebook just presented itself as a very promising option. Lucky! After using it for more than half a year, I have to say I like it a lot. First of all, this Muji notebook kills it in the looks department. With black spine, matte covers and slightly rounded corners, it looks sophisticated, sleek, and very basic, in a good way. With the label peeled off, the front and back look the same. The inside covers are also matte black, with black endpapers. With all the black, it looks more “grown-up” compared to other Muji notebooks. 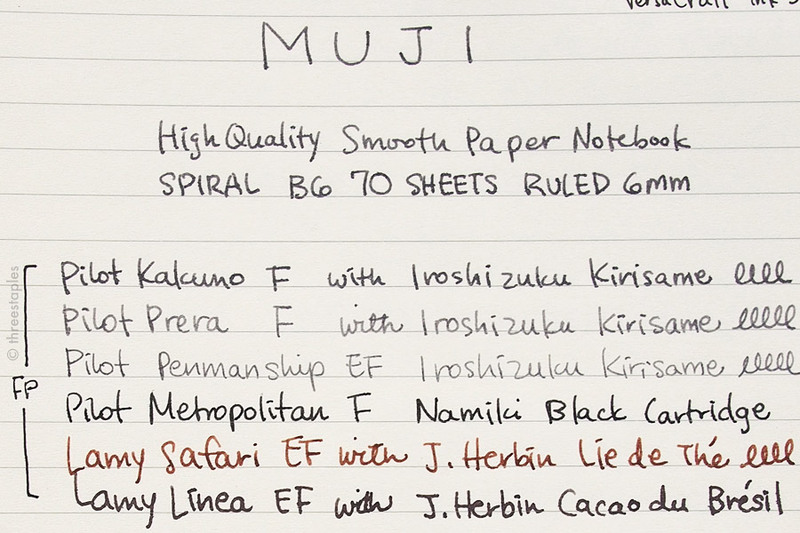 But, in essense, like other Muji notebooks, it’s a no-nonsense, no-frills type of notebook, and highly customizable. I also like that the cover is soft but durable. It feels very pliable in my hands, and it doesn’t scream “Pamper me!”. More importantly, it’s perfectbound, with many, many thin signatures, allowing the notebook to open and stay relatively flat. (I found this reference guide helpful in learning all the different terms related to bound notebooks, i.e. endpapers and signatures). That’s something I learned over the years about notebooks, that the type of binding can tell you how they’ll likely behave, and I try to be aware of it when I shop for notebooks. The signatures in this notebook are sewn by strings, and so far, they have held up nicely. The notebook comes in A5 (roughly 6" by 8") and B6 (roughly 5" by 7"), and I chose B6. Can I tell you how much I love the B6 size in general? For some reason, B6 notebooks are hard to come by, in person and online in the US, but I really like it for its compact size. I just find it less intimidating and easier to handle physically. Muji notebook in B6 (back) compared to Field Notes Original (front). As for the body paper, it’s off-white (a plus for me) and easy on the eyes. The ruling at 6mm (or 0.24 inches) is perfect for my handwriting, and the lines are just faint enough. I prefer graph grid in Field Notes, but for bigger notebooks like this, I’m comfortable with the ruled format. There are little tick marks along the top and bottom, also spaced at 6mm, for some guidance. I’ve been using this notebook for writing blog posts and other ideas and haven’t really needed to be exact in indentation or sketches. There aren’t many bad things to say about this notebook, except for one, which may be very significant for fountain pen users. The label on the front, in Japanese, says this notebook uses high quality paper, appropriate even for fountain pens. I’m not 100% sold on that. While it’s perfectly fine for pencils and gel pens, the paper feels a bit too tooth-y for my Kakuno fountain pens with fine nibs. By comparison, the paper in Rollbahn (spiral) notebooks feel much smoother with fountain pens. Fountain pens are grouped at the top, then gel pens and needle-point pens. Sharpie at the bottom shows through very well. The paper feels every-so-slightly thicker than Field Notes’ Finch Paper. (I realize Field Notes and this notebook are not in the same category but because my blog is more well known among Field Notes users, I will use FN as a convenient reference point.) My fountain pen handwriting showed through a bit on the reverse side, and I see some feathering, too. For someone like me who writes only on one side most of the time, this isn’t a deal-breaker. But it still takes away from the experience of writing and versatility of the notebook. Let’s nitpick some more because why not? When you peel off the label on the front cover, you’ll be able to see where the label was. It comes off easily without any sticky residue, but it leaves a visual mark, like a fade mark. Good thing the cover is dark enough to hide it somewhat, but I noticed this with other Muji notebooks, too. Also, I wish a ribbon bookmark came attached with the notebook. But I should know, Muji likes to keep things simple! No frills, right? Overall, I really like how this Muji notebook looks and feels. It is what I was looking for, a basic notebook that is not wire-bound that stays open flat when writing. Currently at $4.75 USD for B6 and $5.75 USD for A5, both with 72 sheets, I find these notebooks reasonably priced, considering their next-level quality binding. (Midori MD notebooks are really nice, but they can be pricey). I like to keep things consistent if possible, so knowing that these notebooks are part of Muji’s permanent line is very comforting. Too bad that the paper isn’t the smoothest (despite its name) and that fountain pen inks show through somewhat, but that hasn’t stopped me from using the notebook, and I will most likely repurchase it. I simply haven’t seen anything like it yet!